John Moran Auctioneers is pleased to announce two August 21st Studio auctions, including a Studio Decorative Art auction at 12pm and a Studio Fine Art auction at 4pm. The catalogues include a wide selection of fresh-to-the-market art and objects at a variety of approachable estimates (the majority of pieces on offer have been assigned estimates below $3000). Moran’s Studio Decorative Art Auction comprises 282 lots consigned from private Southern California collections and estates. The selections include clocks, sculpture, art glass, silver and objects of virtu, and much more. Many of the fine Continental clocks on offer at the August 21st auction hail from the estate of important collector and connoisseur of fine antique clocks Harry J. O’Connor III. A longtime Laguna Beach resident, O’Connor was well-known for his taste and exceptional collection of clocks and antiques. A fine Louis XV-style gilt-bronze mantel clock consigned from the O’Connor collection features a handsome waisted case flanked by putti and is expected to bring $1000/2000 at the block (PHOTO 1). A delicate Louis XVI-style alabaster and gilt-bronze lyre clock from the collection is also sure to excite collectors and carries a conservative $500/700 estimate. A handsome German bronze-mounted bracket clock by maker Lenzkirch is likewise estimated conservatively, and is slated to head to the block with a $400/600 auction estimate. Additional highlights from the Estate of Harry J. O’Connor include a Chinese silver lidded box repousse decorated with figural scenes, birds and dragons (estimate: $400/600), and a carved mother-of-pearl and silver box decorated with Zeus and Hera (estimate: $300/400). A sleek English silver and guilloche enamel compact with maker’s marks for The Goldsmiths and Silversmiths Co. Ltd. is expected to bring between $300 and $500. Additional silver lots from private collections include a gorgeous pair of German silver and glass compotes with putto-form standards; each is signed for maker V. Mayer’s Sohne (estimate: $600/900). An elaborately decorated “Baltimore Rose” sterling silver tea service with dense repousse floral designs by Schofield & Co. has been assigned a $800/1200 estimate. Additional highlights from private collections include a large patinated and polished bronze horse sculpture by artist Loet Vanderveen (1921-2015 Big Sur, CA) (estimate: $600/800) (PHOTO 2). Born in Holland and settling in California in the 1960s, Vanderveen is well known for his sleek modernist animal sculptures. Ever-collectible art glass selections include a D’Argental cameo glass cabinet vase decorated with sailboats off a rocky coast, which is expected to earn between $500 and $800 (PHOTO 3). A René Lalique “Saint Francois” bird-motif vase is also expected to do well (estimate: $800/1200). Following up on the exceptionally popular toy Alfa Romero offered at their June auction, Moran’s is pleased to bring a Buddy L aerial ladder fire truck to the block at their August Studio auction. The charming toy is expected to bring between $500 and $800. Another fun addition to the catalogue comes in the form of a regulation-size Revolution/Killerspin ping pong table with a later-added tabletop graphic from Andy Warhol’s “Missile Maps” (estimate: $1000/2000). Moran’s Studio Fine Art auction will follow the decorative session at 4pm, and is a larger catalogue at 313 lots. Primarily featuring works by American artists, pieces by European and Asian artists will also make their way to the block, with works ranging from the 19th century through to the contemporary. Continental works both modern and antique are sure to intrigue collectors. French modern landscape artist Pierre de Clausade (1910-1976) is represented in the catalogue by “Dunes sur la Cote [Dunes on the Coast]”, a view of the beach on an overcast day (estimate: $800/1200). Two charming, cubist-influenced still lifes by Swedish artist Sven Gustafson (1896-1967) will head to the block with conservative estimates; a 1961 example by the artist of flowers in a white vase on a red background is expected to bring $500 to $700 (PHOTO 4). Hailing from Austria, Oskar Knapp’s (1944-1987) still life with flowers and wine goblets is a highly detailed composition, and is conservatively estimated at only $500 to $700. Italian artist Sergio Cirno Bissi’s (1902-1987) view of ballerinas backstage will also head to the block with a $500/700 estimate. Known for their biannual California & American Fine Art Auctions, it is perhaps unsurprising that Moran’s Studio Fine Art auction features a host of California landscapes. By way of example, San Diego artist Charles Arthur Fries’s (1854-1940 San Diego, CA) oil painting “Eucalyptus in Moosa Canyon” is executed with a light touch, and is expected to sell for $1000/1500. Moran’s is also set to offer select works by well-known California watercolorists such as Milford Zornes, whose 1981 “Village Through the Trees” belies the artist’s passion for travel, and uses tree trunks to play with composition, breaking up the scene beyond (estimate: $800/1200). One of Zornes’s contemporaries, Jade Fon (1911-1983 Bakersfield, CA), is represented in the catalogue with a view of Half Dome in Yosemite Valley, and is expected to bring between $1000 and $1500. Scenes of pastoral life from a variety of artists will make their way to the block at Moran’s August Studio Fine Art auction. New York artist Clinton Loveridge’s (1838-1915) meticulously rendered painting of cows grazing in a field dotted with wildflowers has been assigned a $1200/1800 pre-auction estimate (PHOTO 5). Adam Emory Albright’s (1862-1957 Warrenville, IL) sweet oil painting of two young girls walking down a farm lane with a baby goat will head to the block with a $2000/3000 pre-sale estimate. “Old Cuss”, a charming oil painting by Los Angeles-based artist, illustrator and scene painter Ben Abril (1923-1995), shows a Model T Ford parked in a field near a post and wire fence (estimate: $1000/2000). John Haley (1905-1991), a modern watercolorist based in Berkeley, CA, is represented in the August auction with a sweet double-sided watercolor depicting farmhouses and a barn in a rolling hills landscape (estimate: $1000/1500) (PHOTO 6). 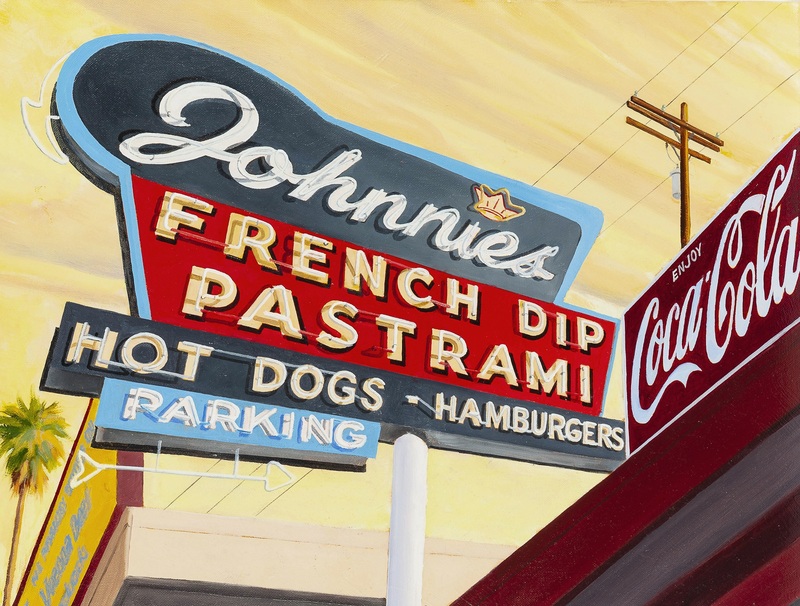 Select work by contemporary artists consigned from private local Southern California collections will surely entice collectors; a brightly colored, graphically dynamic oil on canvas by artist Kristopher Doe (20th Century California), titled “Johnnie’s French Dip”, provides the viewer with an angle on the Culver City, CA restaurant’s iconic neon sign (PHOTO 7). Jon Francis’s (b. 1940 Santa Barbara, CA) view of three commuters waiting for the train at New York’s Fifth Avenue subway stop is sure to entice interest from East Coast buyers (estimate: $1000/1500). Gary Ray’s (b. 1952 Venice, CA) quintessentially Californian landscape, “Poppies and Oaks”, is estimated to earn between $700 and $900. Two charming illustrative works by Los Angeles area artists will make their way to the block; the first, “A Mind of Her Own”, by influential women’s magazine illustrator and educator Pruett Carter (1891-1955), is a wonderful example of the artist’s evocative work (estimate: $2000/3000). Joe Duncan Gleason’s (1881-1959 Glendale, CA) illustration for Cosmopolitan Magazine’s “Beyond the Age” adeptly plays with composition and negative space, and is expected to earn $1500 to $2500. A contemporary still life by Chinese painter Jove Wang (b. 1962) featuring fish, clay pots and lobsters will go to the block with a $1000/2000 estimate. Peter Ellenshaw’s (1913-2007 Santa Barbara, CA) view of the Laguna Beach shoreline perfectly captures the play of light over the rippling water (estimate: $3000 to $5000). James A. Fetherolf (1925-1994) is represented in the August catalogue by “Clearing”, a grand view of shafts of sunlight breaking through cloud cover above a snow-capped mountain range (estimate: $2000/3000). John Moran’s August 21st Studio Decorative Art Auction will commence at 12pm; the Studio Fine Art Auction will start at 4pm. The fully illustrated catalogues for each session will be available online in early August. Online bidding will be available via the Liveauctioneers, AuctionZip and Invaluable platforms, as well as via Moran’s new app. All John Moran auction events take place at their headquarters: 145 E. Walnut Ave., Monrovia, CA 91016. Free public previews for both auction sessions will run concurrently; preview will be open Friday, August 17th from 10am to 4pm; Saturday, August 18th from 12pm to 4pm; Sunday, August 19th from 12pm to 4pm; Monday, August 20th from 10am to 4pm; and on Tuesday, August 21st, the day of the auctions, starting at 10am. John Moran’s next Decorative Art auction is their Traditional Collector auction, scheduled for October 2nd. Moran’s Traditional Collector events feature French and Continental fine art, furniture, silver, and decorative arts alongside Chinese, Japanese and other objects. Moran’s next fine art auctions are their October 24th California and American Fine Art auction, which features a wide range of American works of art dating from the 19th century to the present; and the Women in Art auction, which will take place on the same day and features by women artists from around the globe. John Moran Auctioneers is always consigning for upcoming auction events; visit www.johnmoran.com for information regarding consignment or to view highlights other upcoming auction events.